Detailed changes found in Metro 7 can be found here and changes in 7.1 can be found here. Upgrades to Metro 7 are available now! Metro is cross platform. See system requirements. The keyboard window allows direct entry from the mac Keyboard or mouse and also expands to reveal an advanced arpeggiator under the hood. Great for using your notebook computer to control AudioUnit (AU) or VST software synthesizers. In Metro 7, the arpeggiator has been significantly enhanced with many new features and renamed to the Revolution Arpeggiator. Support for AudioUnit Synthesizers including Apple's built-in DLS/SoundFont II. Easily select any compatible SoundFont. Program names generated automatically. Convert AudioUnit synthesizers to audio by mixing tracks. Support for VST instruments (VSTi) with up to 32 outputs and 8 stereo aux busses. 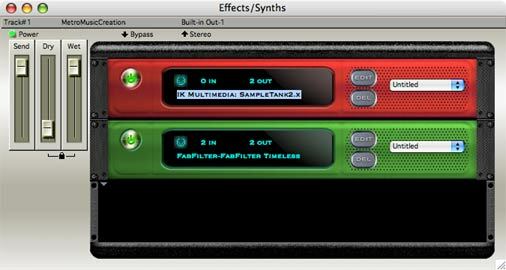 Convert VST Instruments to audio quickly and easily by mixing, rendering or freezing tracks. Supported audio types include MP3, MP4, Apple Lossless, AIF, WAV, OGGV, compressed files and many more. Load songs by selecting folders and save lists of songs as presets. Batch convert multiple files to AIF, WAV, MP3*, MP4, Apple Lossless, Ogg Vorbis or any of many other formats. *requires LAME converter available separately. Auto-size different fields or manually drag them. Drag files to exact time location in song by dropping them either the graphic editor or tracks window. This feature makes the jukebox double as an audio library. Improved Rhythm Explorer™ arpeggiator algorithms and phrase arpeggiator algorithm. Many Other features not listed here!